You know that feeling when you come across something at a thrift store that hasn’t been loved in a while but you’ve got the perfect use for it? Or better yet, when the same thing happens while you’re sorting through your own closet or desk drawer? It’s not just exciting because you’re saving money instead of buying something new – but also because you’re giving something a new life that might otherwise wind up in the trash. Well, that’s the spirit behind this week’s giveaway from Kathie’s Finds. Kathie Armstrong’s vintage shop in Maple Plain, Minnesota is filled entirely with items – furniture, art, accessories, jewelry and more – that she has rescued, resuscitated and made ready for a new home. Heck, even the building is a historic creamery where she and her husband now both live and work. And even though we haven’t had the pleasure of checking it out in person, we’re thrilled to bring a piece of Kathie’s philosophy to you guys as this week’s prize. Yup, we’re talking about reusable bags. One of our favorite little ways to keep plastic out of landfills is by bringing reusable bags to the grocery store (and beyond). 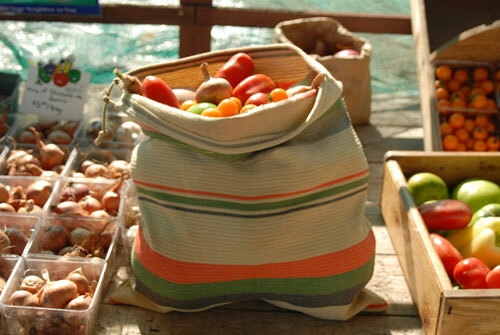 Plus Kathie’s bags actually do double-green-duty by being made out of repurposed things like old blankets (and they’re all hand-sewn by local women). So whether you’re filling them with produce or anything else you’ve picked up at the store they’ll really come in handy and look good doing it. And this week TWO lucky readers are going to score a foursome of ’em to upgrade their next grocery shopping trip (and the rest of you will score a nice little Kathie’s Finds discount so stay tuned for that). PRIZE: A four-pack of reusable produce bags from Kathie’s Finds in an assortment of the designs shown above. BONUS QUESTION: … share a story about something you’ve repurposed, rescued from the trash or somehow found new life for (whether it was for your home, your wardrobe or something else). USUAL STUFF: One entry per e-mail address is permitted. The winners will be selected using random.org and announced on Thursday. Good luck! Get more info about our freebies on our Giveaway FAQs page. Pics courtesy of Kathie’s Finds. BAG ME! Refurnishing my old house and refusing to buy new furniture, all “new” pieces will come from Estate sales, antique markets or Goodwill/Thrift stores. BAG ME! I’ve turned a curtain panel I did not have any use for anymore into a pretty decent scarf. I took a chair that someone was throwing out at the curb, painted it white and recovered the seat, and made it part of my “shabby chic” guest room – completely furnished with hand-me-down furniture from my brother’s old bedroom (desk and bed), my parents’ old living room (rug and mirror), my sister in law’s old Ikea wardrobe and a very old lamp from my grandmother’s house! BAG ME! I have repurposed an old kitchen cart and it now serves as a lovely TV/Media stand in my bedroom. BAG ME! – these would be handy! i found an old frame pedestal type thing :) from goodwill and it now displays my earrings! Nearly everything we purchase for our little fixer-upper has been a craigslist find… so fun. My closet comes from Buffalo Exchange, an up scale second hand store that keeps well-made clothing moving from one loving owner to the next (at an incredible deal), and oh – we just found two beautiful sets of 1928 Spanish french doors on the sidewalk that we will be sanding and refinishing for the back patio! Great topic :). One of my new favorite things to do is buy these single portion jars of fruit at the grocery store and reuse the jars around my house. I’ve use them for fresh flowers, qtip holders and pen holders. It’s a fun way to get another purpose out of something! We’ve bought several things from antique shops, flea markets and 2nd hand shops. bag me! my whole house! I’m a saver of all things I can save. I rehabbed my desk for my office from a vintage, blonde wood mess to a chic, modern, black one-of-a-kind piece of love. I also like to reuse as much paper as I can. If I print on one side, I cut the paper in quarters and use the back side for writing down notes, etc. After both sides are used, I recycle them. It’s not much, but I like to think I might’ve saved a tree here and there. Great giveaway! I’m an avid recycler/repurposer! I use a too-short hand-me-down scarf as my autumn table runner. Since my husband and I have furnished our home with tons of antiques and hand-me-downs, this would suit us perfectly! I love finding a new use for something old or broken. It has allowed us to put more towards paying off the house since we spend less furnishing it. Our guest bedroom furniture was his as a child, and it was his grandparents before him. The dresser still has the original price tag of $12 on the back! I have my dad’s student desk that I use for a makeup dresser and my grandmothers beautiful old sewing machine cabinet (the machine still works too!) is my nightstand. We have lots of other items from our families and thingswe have scored from estate sales and antique stores. I took an old suitcase and made it into a bed for my puppy! Super cute! She loves it! I have a blue avocado bag that is on my keychain and I LOVE it! As for repurposing, I just did a blog post about scratched up and/or ugly picture frames that I shabby up using scrapbook paper. I love yard-saling so I have repurposed so many things I can’t even begin to list them. When I was in high school, I was very into customizing everything I owned in my bedroom scheme of black/white/pink. And because I had little money to toy around with, I made use of art supplies I had on-hand. Instead of purchasing cute kleenex holders, I painted used ones and made them into boxes I could fill with new tissues. I’d re-paint dollar store and goodwill trinkets, etc. Nowadays, if I can’t salvage cute shirts, I try to make them into something else (pillow covers, bags, bracelets, headbands, etc.). Bag Me! Using old t-shirts to make headbands and colorful hair ties. I recently painted an old foot stool and made it super cute! My husband had some silver lamps in his bedroom that just did not go in our bedroom after we were married. I spray painted them with hammered metal paint and they look like new! Please… I’m a teacher! EVERYTHING can be repurposed in an elementary school classroom! We recently tore down a wall (story at http://ourportlandfoursquare.blogspot.com) in our master bedroom and used the studs we removed to make the frame for a new (soon-to-be-upholstered) headboard. I adopted an unwanted, sorely abused antique chair that was left over at a yard sale that I worked at about two years ago. We tried to put it on Craig’s list, and then Freecycle, but NO ONE wanted it…even for free! The chair has found a new home in my bedroom, where it’s the perfect height for putting your shoes and socks on in the morning. It makes me smile every day! I’m working on reinvigorating my mother’s old china cabinet. I repurposed a tablecloth with a scene on it from a fair trade store into curtain panels and I love them so much! I also have many things I’ve pulled from the trash that I plan to do something with someday! We have repurosed a bunch of things, right now our desk in our offce was a vani table that we found at VA Re-store when we stopped by to donate the dors we were switching out in our new home. When you’re on a budget (as most of us are), finding new uses for things you would otherwise toss is essential. In my world, I’ve turned an old woven picnic basket into a knitting caddy. A vintage glass cocktail shaker now sits at my bedside and keeps me hydrated at night (with water). And a favorite childhood sweater is now my favorite winter purse! Bag Me!! Please! I just started getting into shopping at Thrift Stores…my best finds are clothes…who gets rid of such great things?!?!? I score big everytime I am there! I turned our old tv stand into a window seat. We also took a table that was on the curb, sanded and painted it, and it works great as a desk in our home. Bag me! I love finding another use for an item once it appears destined for the recyling bin. Most recently I’ve been repurposing all of my unused sauce jars into craft and sewing item organizers. My huband bought an old ugly box from a thrift store for $3. I really don’t think he has any intention of painting the sucker, but he wants me to put a cushion on top. Eventually it will add a bit of storage and seating to the living room. BAG ME! Love your giveaway! In Canada, we recycle everything: glass, plastic and paper go to blue box, kitchen waste in biodegradable bags made out of corn goes to green bin, yard waste is collected in paper bags, paint cans are collected by hardware stores. Last week I found a great glass jar in the recycle box at work and took it home. It’s now in our bathroom and looks great filled with soaps. Somebody’s trash is my treasure. Let’s save environment! Great job guys. Cheers! We are big into buying old and reusing. I got a great old lamp for my birthday! I am addicted to craigslist and my husband and I were cleaning house today and he asked me to count how many pieces of furniture we have bought from craigslist and the grand total was 12. All have been tweaked in some way, we recovered a couch and chair, made a small dining room table into a desk for our office, repainted a dresser for our bedroom, etc. We have only been married 5 years and it was so much more economical to buy used on craigslist than to try to fill a whole house from scratch. When my husband and I were helping his brother move apartments, we saw a table poking out from behind a dumpster. When we looked closer, it was a solid wood coffee table with clean lines. It has a few stains, but we have started to sand it down and plan on staining/painting it to match the dark wood furniture in our living room. Can’t beat finding sturdy, solid wood furniture for free! There is not a room in our house that doesn’t have something “thrifted” in it! Even the slate tile in our kitchen was leftover from a previous job our handyman did. BAG ME! I’ve taken an old desk discarded on the curb, repainted it, added new hardware and used it all throughout college. I’ve refurbished my grandmother’s old end table into a freshly painted side table and I couldn’t by happier about it! BAG ME ! i turn a very old picture frame into a very cute mirror for my office, i just painted it , add the mirror glass and voila ! Bag Me!! I used an old dresser as my new bathroom vanity!